The Irish Ryder Cup captain won’t be back again in two years. This will be McGinley's last Ryder Cup in an official capacity. 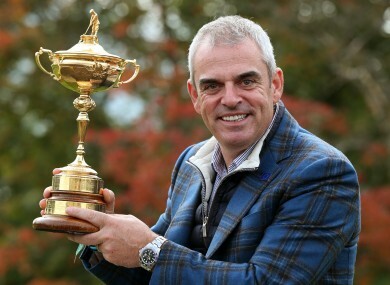 VICTORIOUS EUROPEAN CAPTAIN Paul McGinley insisted Monday his involvement in the Ryder Cup was at an end, saying that like a good heavyweight boxing champion he wanted to quit with an undefeated record. The Irishman, who led his side to a convincing 16.5 to 11.5 win over the United States in the biennial contest following three days of competition at Scotland’s Gleneagles course on Sunday, was widely praised for his work by European team members. But while McGinley’s vice-captains included a former European captain in Sam Torrance, McGinley ruled himself out of both that role and leading the team again come the 2016 Ryder Cup at Hazeltine in Chaska, Minnesota. “I don’t think I’d be vice-captain to anybody going forward to be honest,” said the 47-year-old. “I’m very happy to help in an unofficial capacity but I don’t think I have the personality to go back in as vice-captain. McGinley then made it clear a Ryder Cup career encompassing three wins as a player (2002, 2004 and 2006), two as a vice-captain (2010 and 2012) and one as captain was at an end. “I would certainly like to play a role, if required, a little bit like Alex Ferguson did this week for me,” he added. “I bounced ideas off him. He didn’t preach to me. He didn’t tell me what to do, but what he did was he solidified my ideas and he gave me confidence that, yeah, my hunches were right,” McGinley explained. Defeated US captain Tom Watson found himself under fire from senior team member Phil Mickelson, controversially benched for Saturday’s second day, almost as soon as Europe had retained the Ryder Cup with their eighth win in the past 10 contests. McGinley was reluctant to be drawn into the controversy involving Watson, the eight-times major winner whom he cited as his golf “hero”, but pointed to the way in which England’s Ian Poulter, one of the stars of Europe’s 2012 Ryder Cup win, had reacted to his omission on Saturday afternoon as one of the things that had pleased him most as captain. “All along I had thought that Ian Poulter was going to play in the second afternoon, and he thought he was going to play, and at the 11th hour I decided on Martin Kaymer instead and to break up that dynamic of Poulter and (Justin) Rose which has been so successful. That was a big call,” McGinley said. Email “McGinley vows to bow out 'undefeated like a good heavyweight champion'”. Feedback on “McGinley vows to bow out 'undefeated like a good heavyweight champion'”.